Clever Bulletin: Rihanna and Chris Brown, Kobe and Vanessa Bryant spark rumors: Who should not get back together? 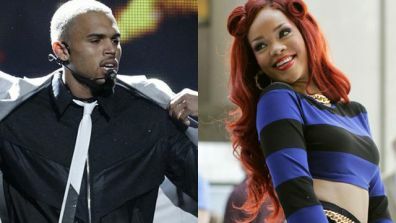 Rihanna and Chris Brown, Kobe and Vanessa Bryant spark rumors: Who should not get back together? Today is Rihanna's 24th birthday, and who does she want on her "Birthday Cake"? Chris Brown, if you believe the reports. According to MTV, the song's producers, Da Internz, said their upcoming remix of Rihanna's "Birthday Cake" features a cameo that would "shock the world." Rumors of both a professional and a personal collaboration with Brown began to fly, especially after the ex-couple was seen embracing in purported photographs from her birthday party. Last Thursday, Miss Info blogged that Brown IS featured on the "Cake" remix -- but Da Internz denied it in a deleted tweet. Miss Info later updated her story, explaining that Rihanna is allegedly being pressured to shelve the "Birthday Cake (Remix)." So has the superstar duo reconciled, three years after Brown pleaded not guilty to assaulting his then-girlfriend? Not likely, given that the newly minted Grammy-winner was recently photographed hanging out with girlfriend Karrueche Tran -- and being attacked by a flock of seagulls, according to The Daily Mail. Meanwhile, TMZ is reporting that Kobe and Vanessa Bryant may call off their divorce ... From Rihanna and Chris to Kobe and Vanessa to Heidi and Seal, let us know: Which celeb couple should NOT get back together?